Thank you Endless Fluff for sending us this game to review! Claudia has been living with her uncle on the peaceful island of Sea Cross. Her uncle is a great inventor who helped fashion a leg brace that enables Claudia to walk despite her illness. He also has been constructing an enchanted lantern he could never get working. One day, Claudia wakes up to find her uncle missing and a note telling her to take the lantern and some money and go back to her parents since danger is eminent. Not wanting to leave without saying good-bye, Claudia sets off to find her uncle despite his suggestion to flee. Taking the lantern with her, Claudia sets off on her journey. As she’s walking she finds some friendly elemental faeries that are surprised she can see them. These faeries, or fae as they are called in the game, teach her how to use the lantern’s powers and defeat the evil fae that are trying to take over the world. The lantern itself is filled with orbs of various colors. Your goal is to combine at least three orbs of a similar color horizontally or vertically. Combining purple orbs enables you to walk. Blue orbs charge up your water elemental and the red orbs power up the fire elemental. The wind orbs are yellow and the earth orbs are green. Lastly, there are gray mind orbs that can break the effects of poison, flame or blinding spells cast on you. Strong Points: Captivating story and puzzles; multiple endings and plenty of levels. Weak Points: Low resolution graphics. Moral Warnings: Magic and mystical references, animated violence, mild swearing. While there are some neutral fae, most of them have an elemental strength and a weakness. For example earth fae are weak to fire and fire fae are weak to water. As you progress through the levels you’ll find gears that you can use to upgrade your elemental spells and abilities. There is no way to max out your character so make sure to choose your paths wisely. If you change your mind, you can reset your lantern but it will cost you a gear to do so. Each of the fifty levels starts off by showing you the objectives and scores and time limit to break. Once you begin, the story sequence will commence and you are given a chance to power up or start walking by lining up purple orbs. Later in the game you can charge up elemental barriers to help protect or speed up your attack powers. Once you’re all shielded up, I recommend doing chain reaction spells by doing multiple matches in a row; these increase your attack spells substantially. One you have a nice chain in the works, then start walking and wait for your first enemy to appear. There are two modes in this game: battle mode and gather mode. If you are fully prepped like I recommended you won’t have to worry about gathering initially. All you need to do is pick your target on the top and click the element to send at it. When you’re out of usable elements you’ll have to click on the lantern part of your screen and start lining up your orbs again. Rinse and repeat until the battle is over. Claudia has a health meter and you can use some of the elements to fill up your health if you’re in a pinch. Later on you can learn a healing mist spell by combining fire and water elements in the battle screen. The toughest spell cast on you is poison as it will corrupt your orbs and drain your health until it’s eradicated by combining mind orbs. Make sure you take out all plant faes first! If your health gets drained Claudia will retreat and you’ll have to start the level over from the beginning. While there is not much violence there is some and the story is not always cheerful. There is death and revenge and a story of a love affair that went sour. There is a little bit of blood but no gore. I was surprised to find the D word in the game. As you can guess there is some magic use and Claudia is regarded as a sorceress in the game. Lastly, there is some mysticism with talk of the fae and a human race sharing similar spirits. Claudia's near death experience gives her abnormal powers since she's in tune with both worlds. The graphics are anime like and the voice acting of the faes sound Japanese. The background music is really well done and is memorable enough to get stuck in my head. My only complaint on the graphics is that they are extremely low resolution. I wish the resolution could be modified. On a positive note, I like how you can have the game run in a window or full screen mode. While the game ran fine most of the time I did have it crash to my desktop once. Another glitch I discovered is that you can't properly start a new game after beating it, you must exit and restart the game. There are multiple endings, one for each difficulty (Easy and Hard). There’s plenty of replay value to see both endings and to try and improve upon your score or time to beat the level. The price tag is a reasonable $15 and there is a demo available if you want to try it before buying it. While I enjoyed playing this game, I was a little put off by the swearing and new age spiritual references. 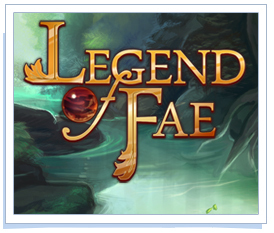 If you don't mind those issues and enjoy puzzle games, you'll definitely want to give The Legend of Fae a try!